A lot of people ask me if shoe games (4, 6, 8 deck) can be beaten by card counting. Also, what are the advantages/disadvantages of casino shuffle machines compared to dealer shuffles? 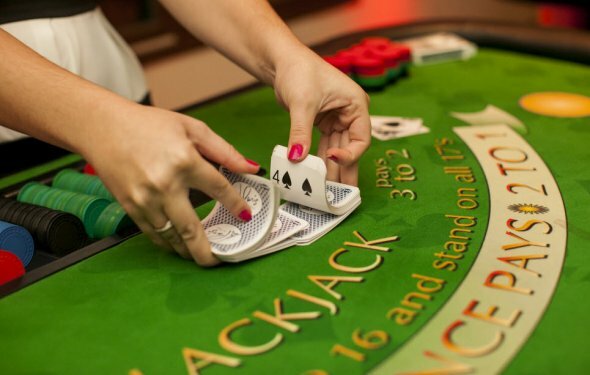 As is usually the case with professional Blackjack, it can be a complex answer. But here’s the rundown. Shoe games are completely beatable by card counting. The increased number of decks DOES decrease the advantage of the game. But that is often counterbalanced by other factors like better rules or sometimes really great penetration (the number of cards cut off before the shuffle). If you are using a count that converts to a true count, you can still play a great winning game at 6 and 8 decks. The rule of thumb is, if everything else is the same, the game with the fewest decks is the best. But be aware of the other situations like rules, number of players at the table, and penetration.Many casinos still use a hand shuffle. There is nothing to fear about a hand shuffle. Dealer’s aren’t shuffling in a way that cheats the player. They are just following a pattern that the casino has trained them to use that will cause a “random” shuffle for the next shoe. The downside to the hand shuffle is that it takes time, slowing the game down. The upside to the hand shuffle is that, if you’ve mastered shuffle tracking, and the casino has a trackable shuffle, you can sometimes exploit the hand shuffle. But finding trackable shuffles is rare these days. There are 2 types of shuffle machines. The first of which is a random shuffle machine that takes all the cards (i.e. all 6 decks or 8 decks) and shuffles them together. Then the dealer takes the full stack of cards, has a player cut, and puts it into a shoe and deals. These shuffle machines are great. They speed up the game and having nothing that a player should fear. The only downside is that you cannot shuffle track a game that is not hand shuffled. The second type of shuffle machine is the CSM. If a dealer deals out 1-4 rounds, then takes the used cards and puts them into a machine that he is continually taking cards out of, then he is using a CSM. These machines continually shuffle together 3-5 decks, making it impossible to predict what types of cards are left in the shoe. Thus, it’s impossible to count a CSM game. Some people panic that all casinos will start using them, and card counting will be a thing of the past. However, they’ve been around for quite a while, but still haven’t caught on. I was in a casino recently, and they had about 30 blackjack tables, of which 4 had CSM’s. The casino was packed, but the CSM tables were empty. Players just don’t like them. Plus, they’re expensive for casinos to have and break down a lot. So I don’t see them taking over. Hopefully this clears up what shuffles and number of decks to play and not play when counting in the casino. You know what, even if you’re not counting, don’t play CSM games, because we just don’t want to encourage them in the casino!